This topic provides a description of the controls on the Image Composition form. 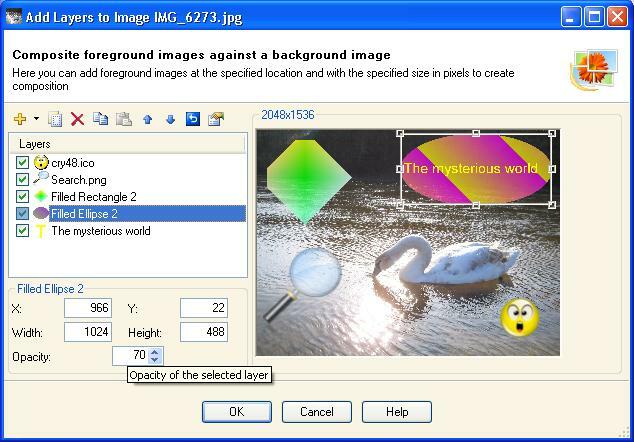 To create composite image click Composition... menu item from the Tools menu. To add foreground images against a background image press Add new layers toolbar button above the Layers list view and select images to add. You can use toolbar buttons to duplicate foreground images, to remove the selected layer, to copy and paste images and to change Z-order of layers. To draw text strings, rectangles, ellipses, filled rectangles and ellipses press arrow to the right of Add new layers toolbar button, select a corresponding shape or text menu item, specify layer properties as needed and press OK button in the layer properties dialog. You can modify properties of selected layer later pressing Layer Properties toolbar button. To display or hide layers use checkboxes shown next to each item in the list. You can set the position, the size and the opacity of the selected layer in pixels entering values. Press OK button to flatten the layers and display composite image in a new tab page.